Strictly Come Dancing winner Joanne Clifton stars in the Jazz Age musical Thoroughly Modern Millie. Recently seen lifting the glitter ball trophy with her celebrity partner news and sports presenter Ore Oduba, Joanne will miss the annual Strictly live tour as she concentrates on the role of a Kansas girl determined to make it big in New York City. And while she is starring in her own show, Ore will partner Joanne’s sister-in-law Karen Clifton on the Strictly dance tour. Based on the 1967 movie starring Julie Andrews, Thoroughly Modern Millie is set at the height of the Jazz Age in 1920s New York City when ‘moderns’ including a flapper named Millie Dillmount were bobbing their hair, raising their hemlines, entering the workforce and rewriting the rules of love. From explosive tap numbers, to a ‘Fred and Ginger’ dance routine on a window ledge and featuring hit songs including Not For The Life of Me, the show is funny and entertaining for the whole family. As well as being a major success in the dance world, Joanne’s theatre credits include taking on the lead role as Marilyn Monroe in the Norma Jean Musical. She will be joined in Thoroughly Modern Millie by Michelle Collins as Mrs Meers. Michelle’s most recent role was Genie of the Ring in Aylesbury Waterside Theatre’s pantomime, Aladdin. Prior to that she toured in Chitty Chitty Bang Bang. Thoroughly Modern Millie will be at Milton Keynes Theatre next week at 7.30pm Tuesday (January 24) through to Saturday 28, with additional 2.30pm matinees on the Wednesday and Saturday. 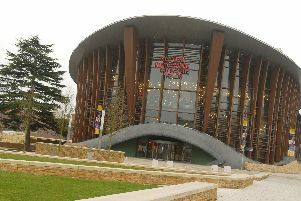 Tickets from £17.50, book online at www.atgtickets.com/miltonkeynes or call the box office on 0844 871 7652.